Yeah, but: It's hard to evaluate. It's like being asked what you think about off-white paint. It's just there. 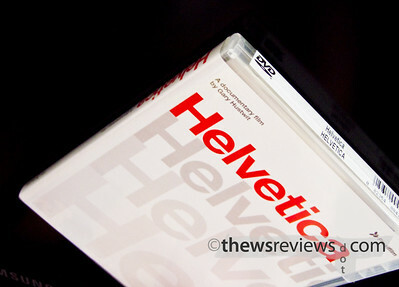 The Long Version: There aren't that many good typefaces, and Helvetica is one of the classics. Modern, clear, Swiss and san-serif, in the past fifty years it has become the default for signage and corporate identities. In his directorial debut, Gary Hustwit had the brilliant insight to explore the ubiquitous. The feature-length documentary Helvetica is the result. The film's not just about typography, but explores many aspects of design and culture. It's said at one point that typography looks like it's about the letters, but that it's really about the space between the letters. "Helvetica" looks like a documentary about a font, but it's really about the design and its role and influence in culture. It's a fascinating look at something that goes unexamined every day. One of the points that the documentary makes is the ways typefaces affect the tone of what's written. It implies an interpretation. Imagine the word "Shark" written in script or in bold block letters: the word is the same but it says something different. At the same time Helvetica is shown to be something of a chameleon. It's the font for American Airlines and American Apparel, and each company uses it to project a very different image. After watching the documentary, I start to see Helvetica everywhere, adding my own experiences and examples to the dozens of divergent uses shown in the movie. The format of the movie is a mix of talking-head interviews interspersed with examples of designers at work and samples of popular culture, with a score that's usually understated and well-chosen. The film is 80 minutes long, with another 95 minutes of interviews included as bonus features. I'm glad that it was perpetually rented out at Queen Video because it spurred me to eventually buy my own copy. I had to laugh when I saw that the 'security seal' uses Helvetica to identify the package - the documentary literally can't get away from the influence of its subject. HelveticaFilm.com, the main web site for the documentary. Wikipedia has pages about the documentary, the typeface, and Arial, a derivation on Helvetica that's also mentioned in the film.